Composite fillings are typically administered in one appointment. The affected tooth is numbed, cleaned, and prepared for the filling material. 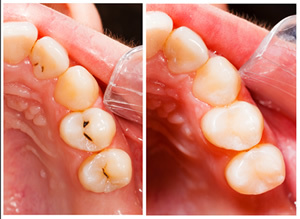 The pre-determined filling material will be placed, shaped, and polished to restore your tooth to its original state. Chipped, misaligned, stained, or cracked teeth can be quickly and easily be fixed with dental bonding. During the dental bonding process, the dentist uses a durable, tooth-colored composite resin to fill cracks and gaps, reshape teeth, and conceal stains to restore your smile's natural beauty. After applying thin layers of the bonding material to the area, the resin is cured using a specialized lamp this hardens the resin for strong, long-lasting results. Resin is custom tinted to match the exact shade of your teeth, the results are excellent, and the dental bonding is virtually indistinguishable from your natural teeth. The versatility of dental bonding is unsurpassed, and compared to other cosmetic procedures; the cost is relatively economical.